We had another aggravating visit to Home Depot today. I hate the place -- I'd rather drive an hour out of the way to go to Lowe's -- but they were the only store that carried the exact type of insulation we needed for insulating under the floor (unfaced 23" wide batts, roughly 7" deep), so to Home Depot we went. First, there was the aggravation of the staff on the floor: ask a question and they half ignore you, continuing their conversation with their coworker, then they are unable to answer you because they don't know anything about the store. Or better, this time one woman actually was backing away from me as I asked her a question. Then there was the inevitable half-hour wait in line. Then, as icing on the cake, the guys at the door who think they are in charge of the world refused to take "No, thanks" for an answer when they asked to see our receipt, and I had to call their bluff and suggest that if they believed we'd commited a crime, then maybe they should call the police. Clearly, they were unwilling to do that because they knew damned well that we had not stolen anything and they'd be in trouble if they called the police, so we left unmolested. 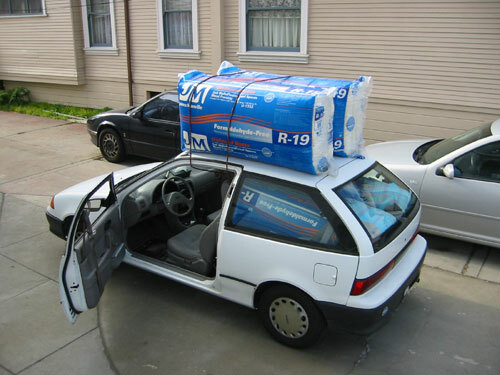 Then we discovered that we could not fit the compressed batts of insulation into the car. Some background: we chose four batts that were still compressed to fit on a pallet with several plastic bands. Stuck together, they were a bit wider than the inside of the Metro. Odd note: it's weird how many people feel the need to honk or flash their brights at you when you are driving a clearly overloaded car with hazard lights flashing on a two-lane street. It's not as if you couldn't see the obstacle from a great distance. Why get all worked up when you can easily just pass?